This week the daylight seems to have caught me by surprise. I guess it’s already a month past equinox, but for some reason I hadn’t adjusted to the reality of the sun setting after 8pm. I’ve been following my patterns without thinking about it much, but since they’re a bit keyed to the amount of light, it seems “suddenly” late and I still have several things to do. As a result, I’ve been up late several days, but on the other side of things, the early daylight makes it harder to keep sleeping in (plus I have scheduled things that require I be up at least somewhat early most days), so I’m getting less sleep than I prefer. I’m also not getting up quite as early as I prefer for this time of year. Hopefully I can adjust (soon) to the late spring/summer timing of light and settle into a stable pattern that allows adequate sleep again. Weather-wise, it was a sunny day. Though there was frost this morning in the neighborhood, things warmed up later in the day. This afternoon the breeze was cool, and this evening overcast rolled in. 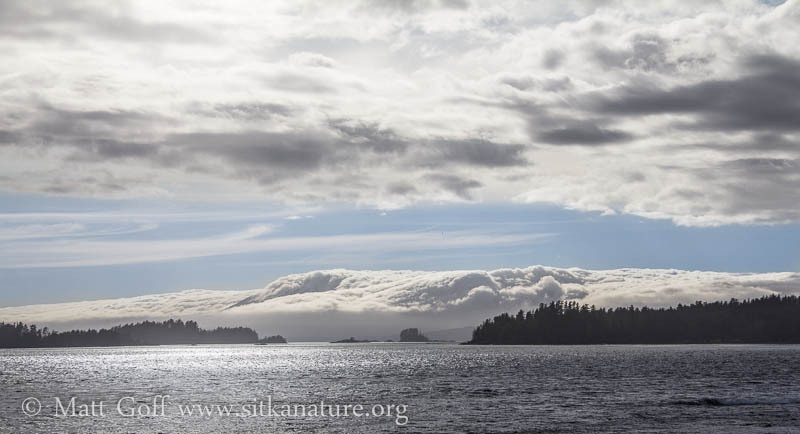 The marine stratus layer that built up around Mt. 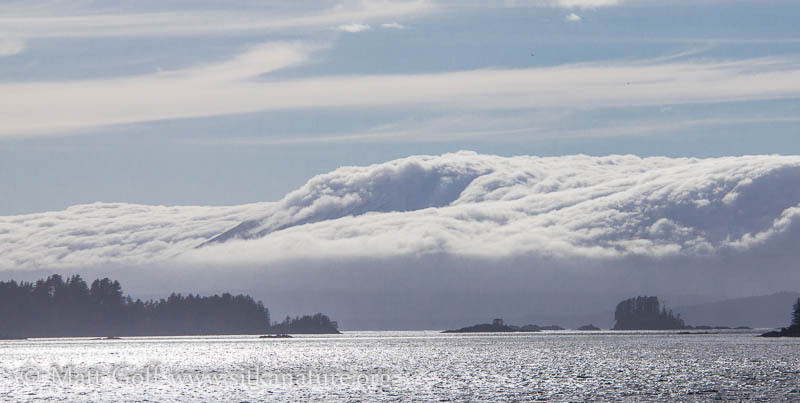 Edgecumbe was pretty neat, but I didn’t get a chance to try for photos until it had nearly completely enveloped the whole mountain. Bird-wise I saw three new-for-the-year birds today. The Eurasian Wigeon was still down at Totem Park late this afternoon. Joining the dabbling ducks out front were a couple of Bonaparte’s Gulls. As I was walking out of Marge’s this evening it took me a moment to place the chirring sound I heard with more typical robin notes. I was surprised to see a waxwing (early for Cedars, late for Bohemians). I didn’t get a great look, but I think it was a Bohemian, as it appeared to have dark under the tail. Plants are growing quickly – some of Marge’s stream violets had started to bloom. On Castle Hill I saw some well-developed siberian miner’s lettuce (Claytonia sibirica) and decided to take my annual taste. They still taste like musty/fungus-y dirt (for lack of a better description). Late this morning the kids and I picked up 8 buckets of seaweed where it had washed up on Sage Beach. Probably a combination of light-driven growth, low tides with some pretty good wind/waves over the weekend resulted in a reasonable pile to gather from. This entry was posted in birding, birds, flora, weather. Bookmark the permalink. are you using the seaweed for a garden matt? great pic of the volcano – reminds me of the marine layer over san francisco, visible from the east bay, like a carpet unrolling. enjoy spring! Thanks Brendan – it might be a stretch to call what I do gardening (at least by the standards my dad continues to set), but the seaweed is for plants in the yard. I imagine it’s well into spring down that way. Here we’re in the process of seeing spring migrants move through and nesting bird arrive and set up shop, plus it’s starting to green up. It’s getting hard to keep up with everything that’s going on!